It’s big, really big. You’ve prepped, prepared and done the big thing and on the other side there’s even more to do! Many of us feel this either after or just thinking about big events or projects in our lives. It feels overwhelming. We think the big thing is the hard part, but often it’s just the beginning. Whether it’s attending a conference, like I just did, changing jobs, moving or even reorganizing our closet, big things of life often create more for an already endless to-do list. It can be daunting. It may feel easier to do nothing than attempt something big. But for your brain and over all wellness, please follow through. Let’s push through those overwhelming feelings by implementing a few key steps to do any big thing. Focus in: whether it’s prepping before or processing after, identify key ideas or goals for the big thing. Once goals are established, a plan can be developed. Example: after learning something new, look at your notes and pull out key items to remember or focus on. If you’re confronting a big project, make a list of the most important elements and focus there. Make a plan: Look at your goals or elements and sort them in order of importance or a logical sequence. For most projects, some items need to come first. Once priorities are identified, you have a starting point to implement the change desired. Keep the plan specific, the tasks simple and in order. There may be numerous items that need to be done simultaneously. For each one, do these same steps of focusing and planning. Example: Making a master to do list, I have sections for each big thing in my life with specific steps. Action items are based on the highest priority for that day or week. Chip Away: I love the Chinese proverb “The man who moves a mountain begins by carrying away small stones.” This adage applies to most things in life. If you can, block off sections of time to work on or process your big project and commit to it. If you can’t do this, do what you can do; carry small stones. Just start. Do something for even just a few moments and you’ll soon move mountains. Example: I have numerous projects, but some are more time sensitive. These take precedence, but when I can, I do small things towards other less time sensitive goals each week. Enlist help: There may be components of your plan that are not your strengths. Assess if you have the desire or time to learn these new things. (It’s great brain exercise!) If not, enlisting help from experts or others gifted in your area of discomfort is a good idea. Example: A few years ago, I wanted to update my websites. I knew this was not my strength and enlisted help from experts. The end product was so much better and my time was better spent on activities for which I was more suited. Review and Revise: Sometimes, projects take a lot of time to do or process. Or your day gets hijacked with other more pressing needs along the way. Don’t fret. The most important step is to stay focused on the overall goal. Your goal may change or need adjustment over time. Review all of the above frequently or at least monthly to see what you need to review or revise. Example: Recently a long-term goal quickly moved into a very short-term project. I shifted other things, enlisted help and it was a great decision. But it took reviewing and revising other goals to accomplish. Now, I’m getting back to the other things which were delayed. Big things in life can be exhausting or make us feel overwhelmed and anxious. Everything big can be broken into smaller goals and steps which eventually can move mountains in ours and others’ lives. [tweetthis]Do big things in life by focusing & taking small steps. [/tweetthis]Take a few moments to process and go through these steps and soon you’ll be implementing the change you want to see in the world! Yay! Great advice! And as I’m struggling to understand how to do my big thing, I love the encouragement that my brain is improving! I might think I’ve not accomplished much, but I’ll take that!!! Thanks, Jill! Thanks Teresa! I hope these steps can help you as you tackle your new big thing! Keep going and strengthen your brain along the way! Love this encouragement here, Jill. I’m not sure if I’ve visited your blog before. I especially like your Chinese proverb about moving a mountain a rock at a time. Just what I need now! Hi Betsy-so glad you stopped by! 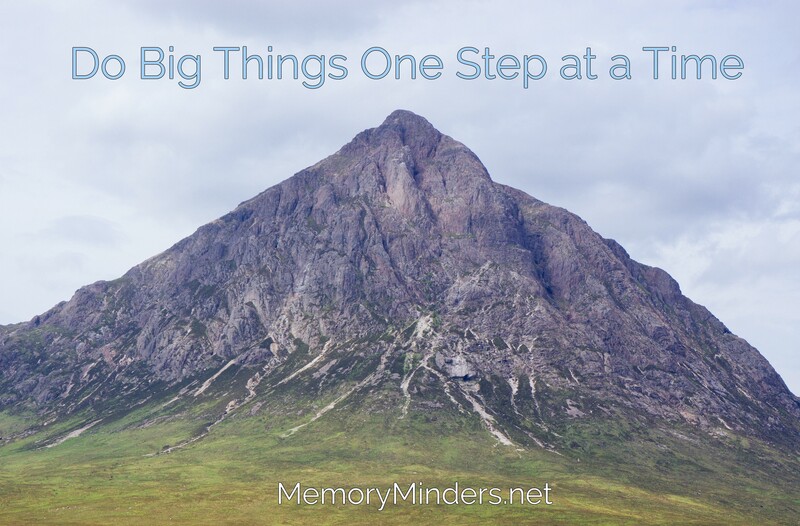 We all can use the encouragement to just chip away at those big mountains in our lives, one step at a time! Thanks for stopping by-always a pleasure to connect with you! Thank you for sharing this article. Being disabled, since my husband of 27 years passed away almost 5 years ago, I have suffered from major anxiety and depression and was constantly focusing so much on the big picture that i would be totally overwhelmed and completely shut down ( I was actually hospitalized for a week), getting absolutely nothing accomplished. There have been so many changes in my life and I have found that when I take the time to break down the big picture into smaller, more attainable parts that I can get anything accomplished. One step at a time is sometimes hard to fathom when you are looking at the larger goals, but once you start to break each one down and prioritize (still having trouble with this part} the smaller steps in each of them, you will be amazed at how much you can accomplish. You are welcome, Brenda. Life really does become much more manageable and enjoyable when we can break things down into smaller steps. I hope this provides some assistance to you. Thanks for stopping by and your comments. Looking forward to seeing you on the blog more often! My bathroom, complete with peeling paint and sagging cabinet doors, waits and mocks me. You pumped me up. I’m ready! Time to go to the home improvement store! Yay! Happy bathroom project, Kelly! Happy to help in the motivation department! Thanks for your encouragment to me! Thanks Christa! Let’s do these big new things!